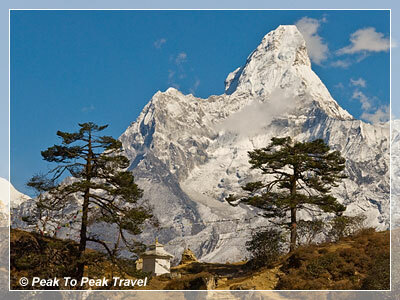 This trek is a once in a lifetime trip to the Himalayas which includes the cultural and natural beauty of the Mt. 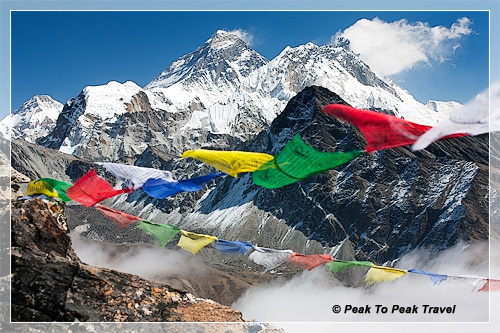 Everest region as well as exceptional views of many of the worlds highest peaks. This three week trek also includes the Thyngbuche Manirimdu Festival at the sacred monastery of Thyngbuche. The trip starts and ends at the famous Tenzing Hillary airport in Lukla, Nepal. There are many beautiful and challenging destinations in this area. Gokyo Ri 17520 ft., Chola Pass 17782 ft., Kala Pattar 18448 ft., and Mt. Everest Base Camp 17500 ft. are some of the Highlighted destinations of this trip. We will use the optional route Gokyo to Thyngbuche through the Sherpa village of Phorttse if weather does not permit the Chola Pass crossing. Individuals should be in good physical condition, and have hiking experience for this trek. Dawa Sherpa will be leading this Ultimate Everest Trek in Fall of 2015. Day 1: Depart U.S., Flight connecting from L. A. 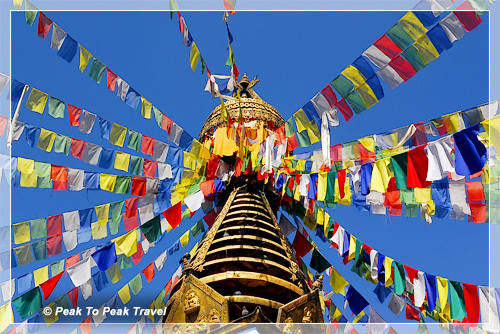 Day 4: A day in Kathmandu Today we will take a sightseeing tour to Swayambhunath Stupa (the famed Monkey Temple), Bodhnath, the largest Buddhist stupa in Nepal, and Pashupatinath Temple, Nepal’s largest Hindu shrine. Shopping for extra clothing and other personal items can be done in Thamel, Kathmandu. Day 5: Kathmandu to Lukla about 35 minute flight and trek to Phakdingma (8700 ft.) Today is our first day of trekking. We will trek about 4-5 hours by the Dudh Kosi (Milky River) and camp/lodge overnight at Phakdingma. Day 6: Phakdingma to Namche Bazaar (11300 ft.) We will trek to Namche, crossing the Dudh Koshi River about six times. Views from the suspension bridges are breathtaking. Mountain goats and the Nepali national bird Danphe are seen in the Sagaramatha National Park. We will stop at Jorsale, about half hour walk from the Sagaramatha National Park check post. After lunch we will continue hiking to Namche by climbing the Namche hill. 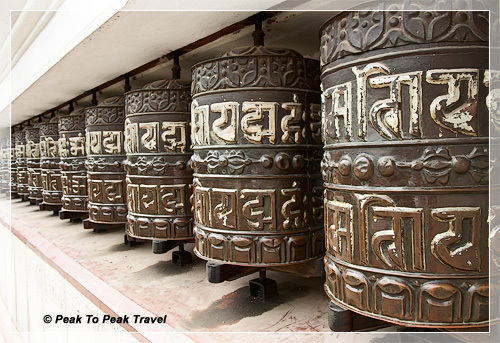 The Namche hill is about a 2 hour climb; it is a beautiful and hard hike. The elevation gain is about 2600 ft., however, the hike is very scenic and you will be hiking with people from all over the world. Day 7: Acclimatization day in Namche (11300 ft.) Today we hike up to the headquarters of the Sagaramatha National Park for a view of Mt. Everest, Mt. Amadablam and Mt. Lotse. We will also visit the Sherpa Culture Center and Museum. In the evening we visit the Tibetan Trading Market. There is an optional hike to the Everest View Hotel for those who would like to explore more. Some people hike up to Thamo Valley and come back to Namche. Day 8: Namche Bazaar to Khumjung (12402 ft.) We will take a 3-4 hour hike through Syngbuche and the Sherpa village of Khunde. 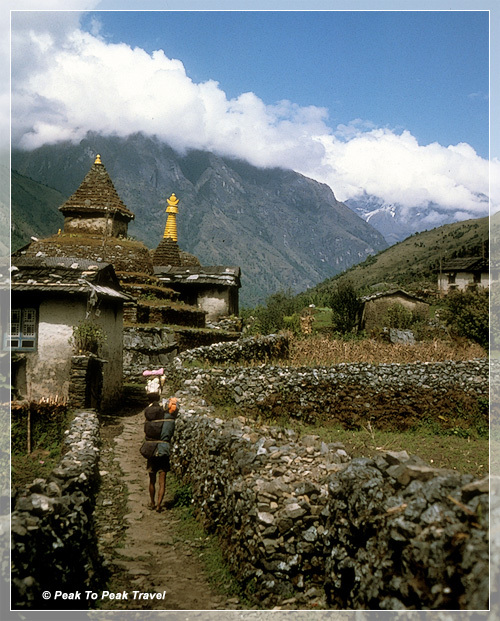 We will visit the Khunde hospital built by Sir Edmond Hillary and visit the sacred monastery of Khumjung. Khumjung is a beautiful traditional Sherpa village with exceptional stone walls. Day 9: Khumjung to Dole (13400 ft.) The trail climbs steeply out of the valley through rhododendron forests which give way to fragrant stands of juniper and large conifers. This part of the trek is especially beautiful in spring when the rhododendrons are blooming. We will hike up to Mong La where the views of Thamserku, Tawachee, Amadablam, and Khantega are tremendous. We will trek downhill to Phortse Thanga (river side) and stop at Phortse Thanga for lunch and then continue our hike up to Dole. The hike from Phortse Thanga is a beautiful uphill hike through rhododendrons and pine forests to Dole. Day 10: Dole to Machhermo (14650 ft.) The trail starts climbing steeply through scrub junipers to Lhabarma (14202 ft.). We will pass the small settlement of Luza (14235 ft.) and continue to hike along the side of the valley, to Machhermo. The views of Mt. Cho-Oyu and Gyachung Khang, Tawache and Cholatse are majestic. We will camp here for overnight and visit the Himalayan Rescue Center (health post) built by Community action Nepal and mountaineer Doug Scott. Day 11: Machhermo to Gokyo (15584 ft.) Beyond Machhermo the trail climbs a ridge for an excellent view down the valley to Kantega and upwards to Cho Oyu. Beyond the ridge the valley widens as the trail reaches the small village of Pangka (14400 ft.). After passing Pangka the trail drops briefly, then climbs to a large cave known as Nilibuk. After Nilibuk we climb steeply along a narrow, newly crafted staircase trail. Atop the staircase the trail crosses a simple wooden bridge to the first small lake, Longponga (15255ft.). The trail now becomes almost level as it follows the valley past a second lake known as Taujun (15448 ft.) and finally up a boulder strewn path to Gokyo (15584ft.). Gokyo is a collection of stone houses and walled pastures on the shores of a large lake known as Dudh Pokhari. We will camp here for one night. Day 12: Hike to Gokyo Ri (17520 ft.) We will take an early morning hike to Gokyo RI for the sunrise view on Mt. 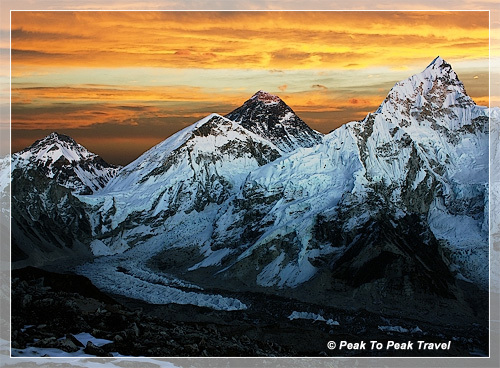 Everest and Cho-Oyu and the Panoramic views of the Himalayas. We descend back to Gokyo for lunch and continue our trek to Dragnag (15387 ft.). We will cross the Ngozumpa Glacier moraine and camp at Dragnag. This is a short trek, about 2 hours from Gokyo. Day 13: Trek to Dozongla (15846 ft.) via Cho La Pass (17782 ft.) The Cho La Pass is one of the most challenging days. Sometimes, the pass can be icy and snowy. We will use an ice axe and ropes if needed. 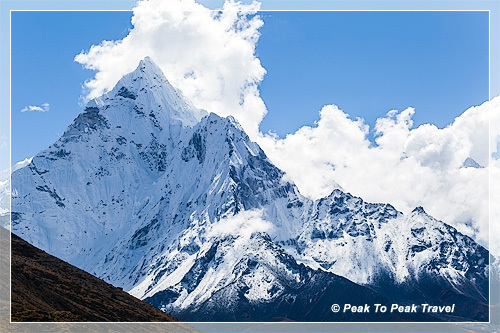 From the pass at Khumbu Valley, we have a close view of Mt. Everest, and we can see Mt. Amadablam, Mt. Lotse, Mt. Pumori and the Khumbu glaciers. If the weather does not allow us to cross the Cho La pass we will take the alternative route via the Sherpa village of Phortse. Day 14: Trek from Dozongla to Labuche (16175 ft.) We hike from Dozongla to Labuche, another popular camping and lodging place on the way to the Mt. Everest Base Camp. The views of Mt. Everest and Mt. Nupse and Mt. Pumori are spectacular from here. Day 15: Labuche to Kala Pattar (18448ft.) This is a beautiful and challenging hike. From the top of Kala Patter you will see Mt. Everest just a few miles away. Kala Pattar is known as the best place to see Mt. Everest. We will then hike back to Labuche (for overnight camp). Day 16: Trek to Tangboche It is a beautiful hike through the Khumbu Valley. We will camp close to the sacred monastery of Thyngbuche and visit it in the morning. From here on it is an easy trek to have fun and explore the Mani Rimdu Festival at Thyngboche monastery and enjoy your adventure. Day 17: Mani Rimdu Festival The Mani Rimdu Festival is one of the top ten festivals in Nepal. The main purpose of Mani Rimdu is the prayers to Phawa Chenrezing, the God of Compassion. It is a believed that the God of Compassion’s blessing brings peace and good fortune to everyone. High lamas (shamans) perform Buddhist exorcism in a vibrant and ritualistic Mask Dance followed by the Sherpa Shebru Dance in the evening during this annual festival. Day 18: Mani Rimdu Festival at Thyngboche. Day 19: Mani Rimdu Festival at Thyngboche. Day 20: Trek to Namche Today we trek back to Namche Bazaar. The trek back from Thyngbuche to Namche is about a 6 mile easy walk. Day 21: Trek to Phakdingma After breakfast we will trek back to Phakdingma. Trekking back to Phakdingma is much easier than climbing up the Namche hill. Day 22: Trek to Lukla We have a short trek back to Luckla, and then we camp or stay in a lodge in Lukla. Day 23: Lukla to Kathmandu Morning flight back to Kathmandu. Day 26: Kathmandu/onward Please let us know if you would like to extend your trip. Book your trip now! We accept PayPal, credit cards and checks. 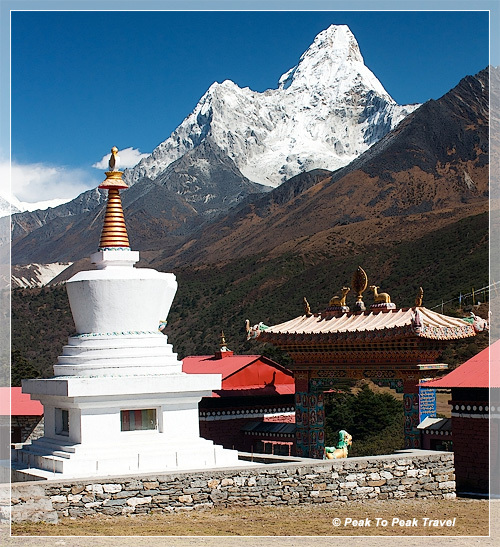 The cost of Ultimate Everest Trek is $3295, Single Supplement is $300. The Trek cost includes trekking permits, the Sagaramatha National Park fee, Meals (breakfast, lunch, and three course dinner prepared by our cooks using local organic produce), tea house lodging (if needed), staff salary, four nights hotel in Kathmandu, one day sightseeing in Kathmandu, round trip airfare from Kathmandu to Lukla and airport transportation. If we need to use the tea house we will choose the best available tea houses/lodges. We will be using brand new North face tents for this trip. Travelers are responsible for round trip airfare from the USA to Nepal (Singapore Airlines has recently reduced their round trip airfare between Denver and Kathmandu with a connection in Istanbul, Turkey to just $1600), mandatory evacuation and travel insurance, bottled drinks and alcoholic beverages, meals and transportation on free days in Kathmandu, personal shopping, tips for staff, visa fees, and airport exit fees. "Our November 2008 trek to Gokyo RI and 5th Lake was the trip of a lifetime--a life giving and life changing experience. Dawa's family and friend connections in the region made for very personal and warm interactions in our teahouse and trail encounters. It felt as though our group was part of an extended family network, allowing for rich and interesting insights into Sherpa life and culture. Dawa and his team made the rigors of altitude and elevation gain seem very comfortable and doable. Our near 18,000 ft summit on Gokyo RI offered spectacular views of Everest, Lhotse, Cho Oyu, surrounding peaks, and the Ngozumpa glacier. Our trekking days were filled with vast, awe-inspiring landscapes, and interesting ecosystems--not to mention animal encounters (Dawa taught us how to 'talk' to yaks). Prepare yourself well, and prepare to fall in love with Nepal!"